Scroll down for reviews of Scott's books! This book has been a fun addition to our learning about Ancient Egypt. An easy read similar to Magic Treehouse. ~ Happy Mom "Priscilla F"
I actually rather enjoyed this book though I hadn't realized it is more likely aimed at the 11 - 12 yr old's. I imagine it may appeal more to boys but is an interesting insight into ancient Egypt for any young reader. I ordered this book for my great granddaughters in 4th and 6th grades. I intend to use it as a summer reading excursion for the three of us. I admit, I don't usually go a bundle on kids' books, but I loved this one, and read it all through in one go. It's atmospheric, carries you along and perfectly captures the excitement/powerlessless of being ten years old... And the historical setting is absolutely spot on. I'll definitely read the others in the series. ~ D.Z.C. Homeschoolers, add this gem to your stack of Ancient Civ historical fiction. The characters are endearing and the plot keeps the reader engaged. Provides opportunity to discuss responsibility to both family and country while learning about the Egyptian city of Thebes. Be aware that the story involves prayer to and the worship of Egyptian gods, including idols and temples. Another opportunity for discussion as long as the parent is prepared for it. I read the Kindle version and was pleased to find it well edited and error free. ~ "Mrs Quiet"
The book was well written and deals with Egypt which is a hot topic these days . . . I believe students will bond with Zet and Kat against the world. Setting the book in Thebes and bringing in a touch of Egyptian mythology makes the story believable and yet unbelievable at the same time. Several different lessons are taught in a fun manner. Taking care of one’s family is one theme that is worked throughout. Caring for others, honesty, and living up to your promises are just a few of the themes touched on. ~ P. Blevins "Career Reader and teacher"
As an adult reader, I enjoyed this adventure story of a young boy and sister playing junior detective on the trail of a conspiracy that threatens an innocent man – and promises a handsome reward for the man (or boy) who delivers justice. The prose is easy on the eye and like tales of a certain wizard, is sophisticated enough and characters well drawn to pull in all ages. The world of ancient Egypt is painted well and fans of Steven Saylor or PC Doherty ancient detective series will lap this one up. Peter’s like the other writers mentioned quickly takes the reader into the ancient world, padding it with enough familiar character types to make one feel at ease in this alien world. Though Peter’s doesn’t shy away from referring to the Sun as a God as most Egyptians would have referred to it, we are immersed and so our suspension goes undisturbed. The main character Zet is a likeable one, and one finds oneself rooting for him in this action packed yarn. Four stars for a book that appeals to both middle grade kids to adults. ~ Oolong "The Cat"
The plot has enough hooks and turns to keep readers of all ages engaged. I appreciate the author's inobtrusive but deft writing style, which has just the right amount of detail and explanation to keep young readers on track, without boring older readers. The plot has a good pace and the dialog is no small accomplishment - the characters speak with modern idioms but nonetheless feel like they belong in that ancient time. I hope that later books in the series empower the younger sister (and girl readers) by giving her a more equal role in the sleuthing. I suspect that would enrich her character, and her relationship with her brother. Good book great for the upper elementary level, though as an adult I liked it as well. Its an easy read with a decent plot. As with most books aimed at the younger crowd whose main characters are children, they take on more responsibility than the typical child would. 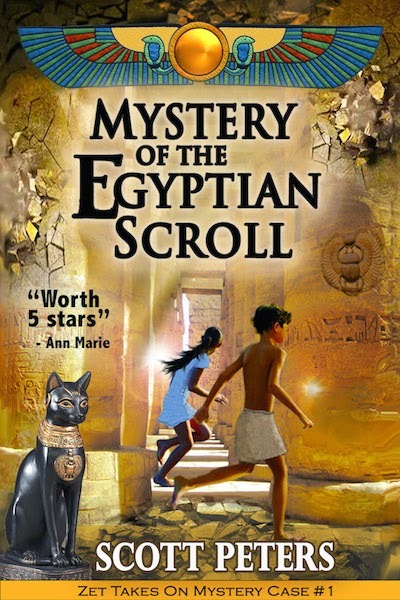 "A Delightful, Fast Paced Mystery for a Younger Person"
In "The Mystery of the Egyptian Scroll," Scott Peters has provided the reader with a fast, paced mystery set in the times of ancient Thebes in Egypt. The book is probably written for the middle school to early high school reading levels. As a former teacher, I am always interested in books that may get children reading, and this is one! Serving in the Pharaoh's army, father has gone to war to fight the Hyksos, and times are hard for the family left behind. Eleven-year-old Zet and his younger sister Kat are left with the responsibility of minding the shop, but each week the children's earnings dwindle until they fear they won't have enough to feed themselves, their baby brother and their mother. So when a thief bounds through the market place, Zet overhears a medjay (police officer) offer a reward for information. So he steps up to the medjay to offer to help catch the thief in exchange for the reward. Of course Kat, his younger sister, thinks he's crazy. Unfortunately, this foolhearty decision soon lands Zet and his sister in dangerous trouble, so deep their very lives and the lives of their family as well as others are in extreme danger. The book is well written with strong description of the characters and the events. Peters depicts a realistic Egyptian setting for this historical novel. Without question, it is an action-packed mystery set in an ancient land with great attention to detail; the book will appeal to young and old readers alike. There are several simple themes running through the book; the most obvious are: Don't judge a book by its cover, and The importance of doing what is right - both for your family and your fellow man. Since things are not what they appear to be, to save their family, Zet and Kat together must learn about people: who to trust and who has evil motives. I bought this thinking it would be good for my granddaughters. Tonight, I decided to read it myself. It was a quick, enjoyable read. I found myself rooting for Zet and Kat. Hope there's more in this series, from the hint at the end, I suspect there will be. I was interested in reading more, so I bought another book by Scott Peters, Curse of the Cobra. Eleven-year-old Zet and his younger sister Kat are left with the responsibility of minding the shop while their father is in a faraway land fighting for Egypt and their Pharaoh. But each week the children's earnings dwindle until they fear they won't have enough to feed themselves, their baby brother and their mother. So when a thief bounds through the market place, Zet steps up to the medjay, or police officer, to offer to help catch the thief in exchange for the reward. This brave, but foolish action soon lands Zet and his sister in trouble, so deep their very lives and the lives of their family are in peril. As Zet and his sister wind their way through the streets of Thebes, the scents and sounds and activity of the thriving commercial city come alive. They meet many people in their quest from the man who grows papyrus to make into paper, to the blind lady on the side of the road, to the merchants in the market, to the high priest of the sacred Temple of Amenenopet. But they are not all as they seem. To save their family, Zet and Kat must learn who to trust, who has evil motives and what those evil motives are. A mystery story involving two young children. Set in ancient Egypt, the children stumble on a conspiracy against the Pharoah and decide to try and save him. The book I imagine is aimed at younger readers, and I didn't realize this until I started to read it, but I enjoyed it anyway. The Mystery of the Egyptian Scroll, by Scott Peters, is a children’s book set in New Kingdom Egypt, in and around the southern city of Luxor. The pharaoh of the time is deliberately unspecified. The plot is lively and straightforward; two children who run a market stall selling pottery, witness a neighbour being accused of theft, and take it upon themselves to investigate. In the process they find out that the accusation is false, but that there is a much deeper and more sinister plot behind it. Basically, in adult terms, they have stumbled into the path of a political move aiming at a palace coup – a problem which did indeed face certain pharaohs of that time. This is a children’s book, so the writing is simple and direct, the characters’ motives are plain and easy to grasp, and the children are supremely competent at solving the problem (albeit at considerable risk to themselves and their family). But the book is also a fantastic introduction to Egypt for children. Places, people and customs are well explained and engaging, so the book is highly educative as well as fun. Problems are solved by thought, perseverance, the gathering of evidence, and negotiation with key people. There is no magic, and religion is dealt with as a normal part of everyday life. I would happily use this book as a way to bring something of the reality of ancient Egypt to life for a young audience. "I look forward to reading the other stories in this series" ~ John W. Cross Jr.
Great book! Can't wait to read the next books in the series! I love the Egyptian style mystery theme! 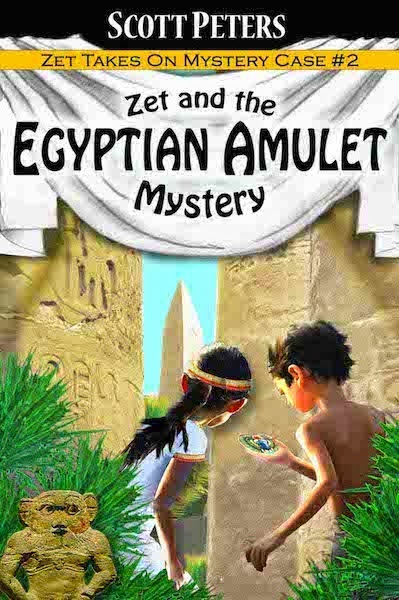 A great story for kids showing interest in ancient Egypt. ~ Patricia Gulley "weyrcottage"
“I enjoyed it as an adult and I am sure youth ..."
A very enjoyable historical mystery, with a target audience of middle graders, "Zet and the Egyptian Amulet Mystery," and its predecessor, "Mystery of the Egyptian Scroll," are delightful for YA and adult readers too. Filled with good characterization and characters who readily elicit empathy, great historical detail, and the conviction that humanity in historical eras was no different in personality or character than those in contemporary society, this is an easy read and a pleasurable read. "This Book should be for Sale at the Metropolitan Museum"
"A must have for mummy lovers"
"Filled with a lot of information!" I have to say I enjoyed the Truth or False section along with learning how they took out the organs. The curses is what really draws me in. Because we never know for sure if the curses are real? Or just something that happens. 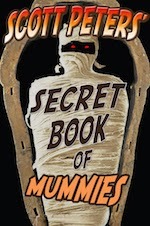 I am a mummy freak so learning more about mummies is just awesome to me. Reading this book brought back memories of when I was in school learning about Egypt and I just fell in love. Now there is just a few pictures not a lot, so this may be a better book for the kids that are okay without pictures. There is so many fun filled facts written in this book, I highly recommend it to those that want to learn a bit more about mummies and the past of them. ~ Autumn "Fallen Over Book Reviews"